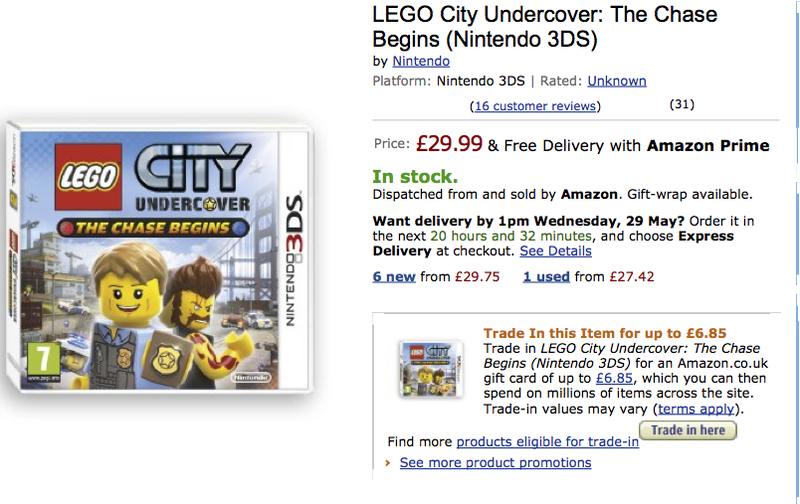 If you want to play the Nintendo 3DS game ‘LEGO City Undercover: The Chase Begins’ you can order it online at £29.99. Alternatively, you can download it directly from the Nintendo channel, for £34.99. This is a puzzling pricing strategy since the game is exactly the same (as far as I am aware, the downloadable game does not have any additional features). Indeed, it could be argued that the downloadable version is cheaper to produce because there is no packaging required, or costs with storage and distribution. Furthermore, it’s not like the pricing difference between a book and an e-book. While the cost of producing and distributing the electronic version of the book should be lower than for the physical version, we could argue that the eBook is more convenient to carry and use. If it has added benefits for the user, then the price will reflect that. I conducted a short poll on Twitter, asking when players would be prepared to pay extra for downloading a game. My extremely unscientific and unrepresentative study did not shed much light, either. Hum… it seems to me that the only difference between downloading the game or buying it online or in a store is when you can start playing it. If you download it, you can start playing it immediately. If you order it from, say, Amazon, the earliest you could get it is by lunchtime, the next day. To keep it simple, let’s assume that this represents a 24 hours wait. So, effectively, this price difference is saying that players would value playing the game 1 day early at more than £5 (i.e., valuation = price difference between the two options = £34.99 – £29.99 = £5). I say ‘more than £5’ because having a physical copy of the game means that you could trade it in, once you are tired of playing the game. The trade in value for this game quoted on Amazon as of May 27th is £6.85 (most likely, the trade in value will change over time – but, to keep it simple, let’s work with this amount). In this scenario, the pricing strategy means that the value of 1 day’s play is £34.99 – £29.99 + £6.85 = £11.85. Posted on May 28, 2013 May 28, 2013 by anacanhotoPosted in Marketing in everyday lifeTagged Price discrimination, Pricing, Video games. Hi Ana, this is interesting. Overtime with games the cost of the physical media goes down but buying it digital usually doesn’t. For example Hitman Absolution released in November last year is £16 on Amazon currently but I saw the digital version on Playstation Network yesterday for a crazy £49.99. Usually with games the longer you keep the money in your pocket the better deal you will get. If you buy games “preowned” then you can achieve even greater savings. However this is all due to change fairly dramatically with the Xbox One and the PS4 and it will be interesting to see how they control preowned games and price new content on these systems. Wow – that is a great difference. Any idea why the price for the downloadable version remains so high over time? I really can not see a demand side reason for that – for instance, it’s not that inconvenient to order and keep a physical copy of the game, is it? So, it seems to be a supply side reason: either being very expensive to make these games downloadable or very expensive to store physical copies of the game once they have been produced. I don’t get the price difference. Also not with e-books. The costs of the ‘physicalness’ of the product is often not super big. Especially with the numbers nintendo games are being produced. Distribution takes up a lot of the costs that are reflected in the price. But the strange thing is, when you order online, that is often charged of separately, or divided over several items. You know I recently self-published a book, and the pricing for that one was also interesting. The production costs of one copy, including a fee for Lulu, for me are (rounded) 3.5 Euro, if I sell it through Lulu.com, anything above that will go into my earnings. Postage is paid separately, so not part of the equation. I also registered it to be available through Amazon and some other channels. Then it gets interesting. In the process of doing so, I also had to set a price. Lulu, which I used for the publication process, also indicates how that price is built up. I wanted my book to be priced lower than 10 Euro, so I picked a price of 9.50. As said before, production costs are about 3.5. From the 6 Euro left, I get to keep about 1 for every copy sold through Amazon. The rest, more than half, goes to… Amazon – ie: distribution. From a costing perspective, it could be that the distribution channel for the virtual copy of games is quite costly to maintain. But somehow I doubt that justifies the 5 pound price difference. Ouch, I had heard the margins were very low, but I never thought they were that bad. I suppose it comes from their power as the leading destination for online shopping: I, for one, like to check if Amazon has the product that I am looking for and I read the product description and reviews, before buying it online or not.